Daily Forex Markets Brief – British Media has reported that the UK is to inform the EU that they are willing to stay in the EU Customs Union beyond 2021. The Government agreed on a new “backstop” earlier this week to avoid a hard border on the island of Ireland. This came after rejecting earlier EU proposals ahead of the looming June deadline. This was despite objections from Foreign Secretary Johnson and Environment Secretary Gove. GBP has rallied well and is the strongest currency as we approach the European open, up from 1.34554 to 1.35687 against the USD. EURGBP is down to 0.87206 from yesterday’s high of 0.87823. 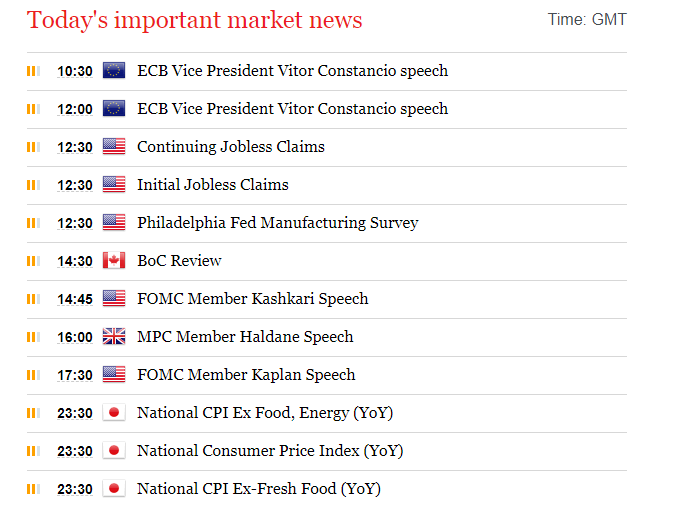 The USD has weakened somewhat, with EURUSD reaching a high of 1.18373 overnight. 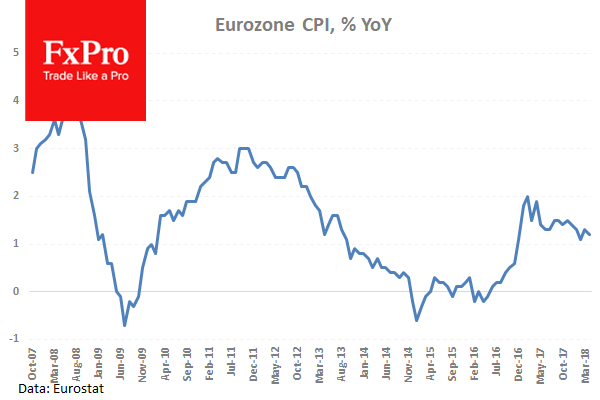 Eurozone Consumer Price Index – Core (YoY) (Apr) came in as expected, unchanged at 0.7%. Consumer Price Index (MoM) (Apr) was also as expected at 0.3%, from 1.0% previously. Consumer Price Index (YoY) (Apr) was also as expected, unchanged at 1.2%. Consumer Price Index – Core (MoM) (Apr) was as expected at 0.2%, from 1.4% prior. CPI data is showing a decrease in the monthly figures, with yearly figures remaining in line with the previous reading. EURUSD fell from 1.18376 to a low of 1.17662 after this data release. US Housing Starts (MoM) (Apr) were 1.287M against an expected 1.310M, from a previous number of 1.319M, which was revised up to 1.336M. 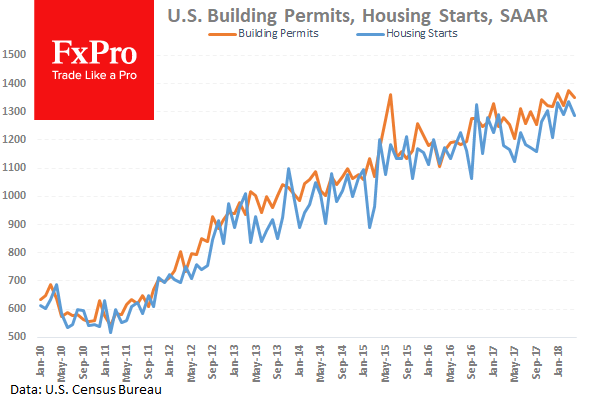 Building Permits (MoM) (Apr) were 1.352M against an expected 1.350M, with the prior reading of 1.354M, which was revised up to 1.377M. This data shows a decrease in activity from previous readings. These data points have been recovering since hitting lows of 0.46M and 0.49M respectively after the financial crisis. GBPUSDhalted its decent at 1.34668 when the data was released. US Industrial Production (MoM) (Apr) was released, coming in at 0.7%. The consensus was for 0.6% from 0.5% previously, which was revised up to 0.7%. This measure rebounded strongly, to reach the highest reading since December 2014 in March, after slipping below the zero line previously. Capacity Utilization (Apr) was also released at this time, with a reading of 78.0% against the expectation of 78.4%, from 78.0% previously, which was revised down to 77.6%. The readings came in line with previous data, with capacity failing to create a new high and missing expectations. USDJPY rose from 110.056 to 110.341 after the release. EURUSD is up 0.10% overnight, trading around 1.18185. USDJPY is down -0.10% in early session trading at around 110.284. GBPUSD is up 0.52% this morning, trading around 1.3560. Gold is up 0.18% in early morning trading at around $1,292.98. WTI is up 0.31% this morning, trading around $71.86. Our preference: short positions below 1.1855 with targets at 1.1795 & 1.1760 in extension. Alternative scenario: above 1.1855 look for further upside with 1.1890 & 1.1940 as targets. Our preference: long positions above 1.3505 with targets at 1.3575 & 1.3600 in extension. Alternative scenario: below 1.3505 look for further downside with 1.3480 & 1.3450 as targets. Our preference: long positions above 0.7495 with targets at 0.7565 & 0.7590 in extension. Alternative scenario: below 0.7495 look for further downside with 0.7475 & 0.7445 as targets. Our preference: short positions below 1297.00 with targets at 1283.50 & 1279.00 in extension. Alternative scenario: above 1297.00 look for further upside with 1301.50 & 1305.50 as targets. Comment: as long as 1297.00 is resistance, likely decline to 1283.50. Silver spot Intraday: rebound expected. Our preference: long positions above 16.2200 with targets at 16.4500 & 16.5500 in extension. Alternative scenario: below 16.2200 look for further downside with 16.1600 & 16.1100 as targets. Crude Oil (WTI) (M18) Intraday: watch 71.90. Our preference: long positions above 71.10 with targets at 71.90 & 72.30 in extension. Alternative scenario: below 71.10 look for further downside with 70.70 & 70.30 as targets. Comment: the RSI is bullish and calls for further advance. The prices are trading above both 20-period and 50-period moving averages.